Published on 13 November, 2009 in People, Poetry and Spirituality by Alastair. 0 Comments Tags: Aotearoa/New Zealand, John O'Donohue, Maori. Our local clergy chapter were meeting this week, and I was ‘hosting’. Usually, part of hosting involves preparing some prayers and worship. As we were also ‘Remembering‘ St Martin of Tours, I had a few things up my sleeve, including a fine shell remembering the pilgrims that stopped at St Martin’s shrine in Tours on the Way of St James. 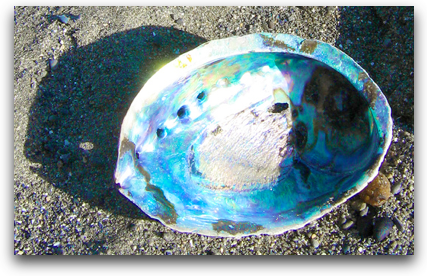 Actually the shell was in my pocket, rather than up my sleeve; and paua were not really the sorts of shells that pilgrims on the way to Compostela normally wore (they were usually scallops… But these paua are exquisite. We have brought back dozens from NZ over the years.